In the broadest sense of the term algae, algae are plants ranging in size from microscopic cells to giant kelp found in the sea. Like most plants, algae thrive on carbon dioxide, sunlight and nutrients. 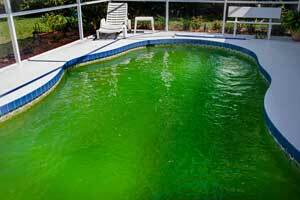 Swimming pools typically encounter three groups of algae: Black, Blue-Green/ Green and Mustard Algae. Swimming pools are like children: don’t watch them, and they will soon get into trouble. Your pool is no different. The best cure for algae is to prevent its growth. This is done by maintaining a good chlorine reading, proper pH, and brushing the pool frequently. There are generally some algaecides such as All Clear, Concentrated Algaecide 60 that can be used prophylactically. Be aware of low costing algaecides since they can often cause more harm than good, especially the ones that foam. If you do get algae in your swimming pool, always start by adjusting the pH, make sure your chlorine level is higher than normal, and brush. In the event the algae do not respond to the higher levels of chlorine then add algaecide. For green algae you have two choices: All Clear, Concentrated Algaecide 60 and All Clear, Green Algaecide, (Copper Based). For yellow or mustard algae All Clear, Mustard Knockout. While copper based algaecide is very effective against green algae, be careful not to introduce large amounts of chlorine into the pool rapidly, such as shocking the pool. Copper can easily precipitate out of the water and cause staining of the pool surface. As the algae are killed, the copper will slowly diminish by absorbing the algae, and when the filter is cleaned it will be backwashed. Black Algae, the pesky one. Black algae have a protective gel like coating its surface, which prevents most chemicals entering the algae cell and disrupting its growth. Pools that have a hard surface such as concrete or Gunite can benefit from the use of an Algae brush to help break the gel, allowing the chemicals to penetrate the algae cell. Rubbing a pool tablet on the surface of the black algae spots is sometimes effective. On large areas of concrete or Gunite pools, Algae Kill can be used. This is a slow dissolving product that kills black algae when sitting on the surface. Caution – this method should not be used on other surfaces, as bleaching of the liner can occur. Never use an algae brush on fiberglass or vinyl pools. This entry was posted in Swimming Pool Products on July 15, 2014 by saniquim.